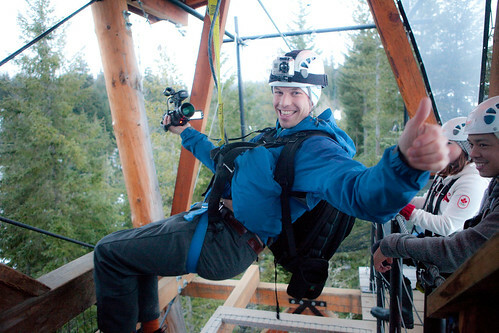 This is the 2nd of several Vancouver 2010 Olympics photo essays created by Kris Krüg. 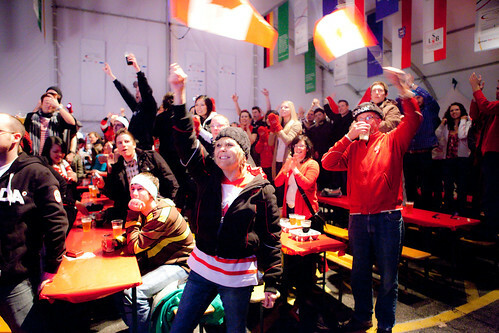 Vancouver is filled with energy now that 2010 Winter Olympic Games has officially started. The last week has been filled with the excited fervor of the last month and anticipation of the upcoming weeks. Here is a photographic look into the last week of adventure and celebrations, before the officially opening of the Games in Vancouver. 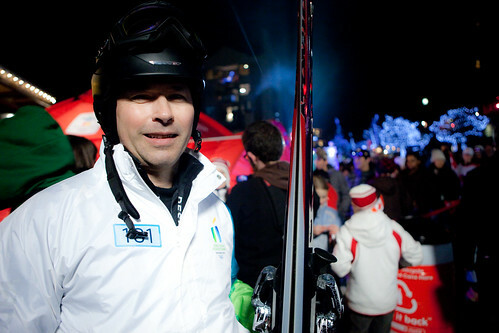 The Olympic torch was carried downhill on the Blackcomb mountain by world champion and olympiad Steve Podborski. Steve won a bronze medal in the 1980 Winter Olympics in Lake Placid. Currently he is part of the VANOC and works within International Relations. 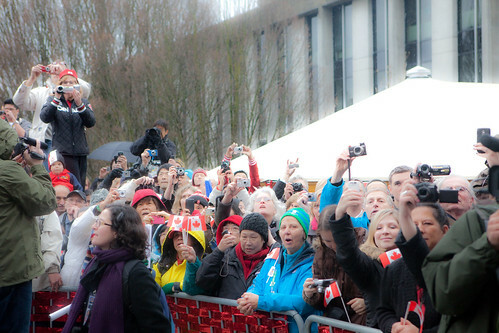 Premier Gordon Campbell seemingly is Canada’s number one fan. 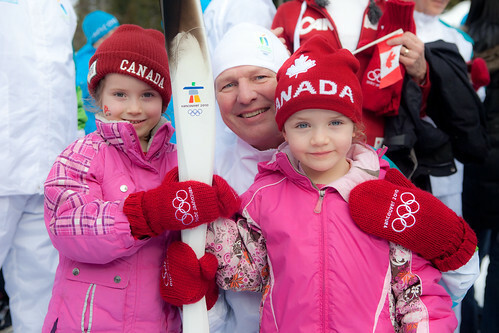 Campbell has travelled around Canada for the entire length of the torch relay. 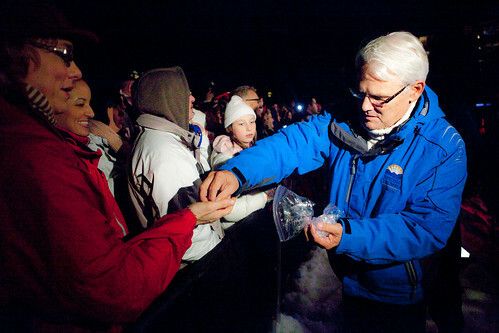 Here he is handing out coveted British Columbia Olympic pins to fans at the Whistler Torch Celebration. Vancouver is part of the Coast Salish territories and has a Four Host First Nation welcoming committee as part of the 2010 Vancouver Olympic Games. 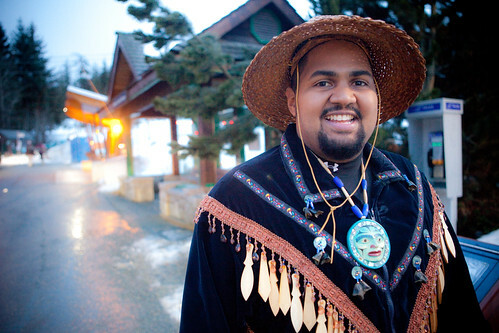 Willie Lewis, dressed in a traditional Aborginal outfit, was part of the Whistler Torch Relay Celebration. The Olympic Torch had an extended route through all of Vancouver with the relay going through all of the neighborhoods in Vancouver. 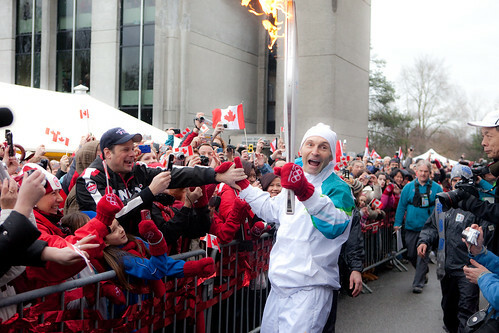 The Vancouver city council accompanied by Mayor Gregor Robertson welcomed the torch when it came to City Hall. Vancouver Olympiad Lori Fung, with her gold medal, was present when the Olympic Torch came to the Vancouver City Hall. 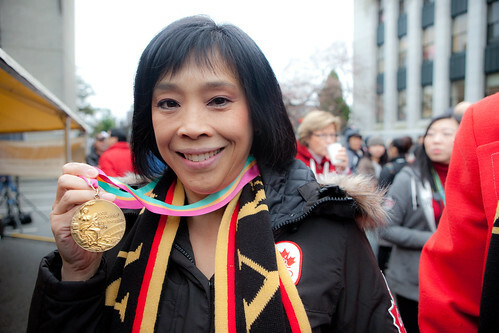 Fung was the first gold medalist awarded in the sport of Rhythmic Gymnastics during the 1984 Summer Olympics which were held in Los Angeles, CA. This is the first Olympic Games where people are full-on involved with technology and the internet. Many fans often have out their own cameras to capture their memories themselves. With this sort of documentation present for the Vancouver Winter Olympics, some of the best Olympic news coverage will be coming from the internet! There are many different pavilions popping up all over Vancouver with all sorts of awesome installations and displays. 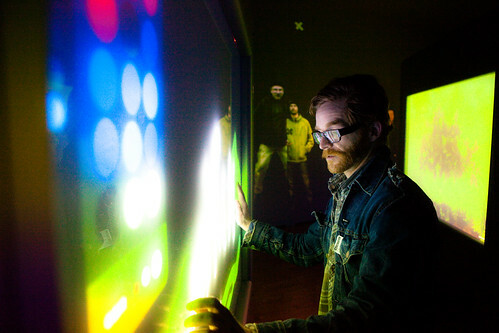 This is a touch screen graffitti media installation in the DigiBC part of the BC Pavilion. Here one of the creators is having fun creating some interactive art. 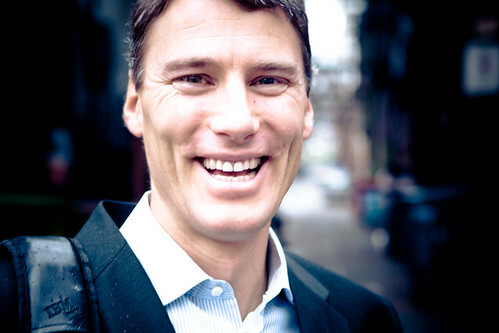 Mayor Gregor Robertson has been a very busy man during the preparations for the Winter Olympics in Vancouver. Here he is outside of the W2 Media and Culture House in the DTES. He was the speaker at the ribbon-cutting of this independent media house which opened to the public. 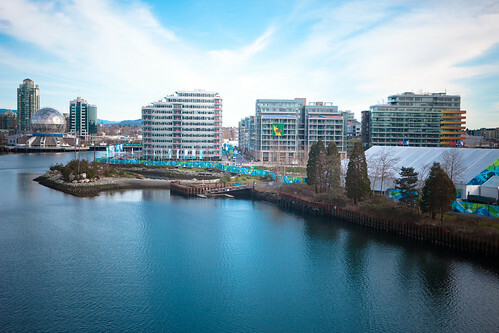 The beautiful Olympic Athlete Village sits on the waters’ edge of the False Creek. There was a bit of controversy when the athletes from Australia hung up their official Aussie flag, which is a copyrighted image. Despite some grievances with the IOC, Vancouver fought to keep the flag up! Bombardier, the company who designed the Olympic Torch for the Vancouver Winter Olympics, also designed the Olympic Line, a train that runs from the Main Street Skytrain Station to Granville Island. 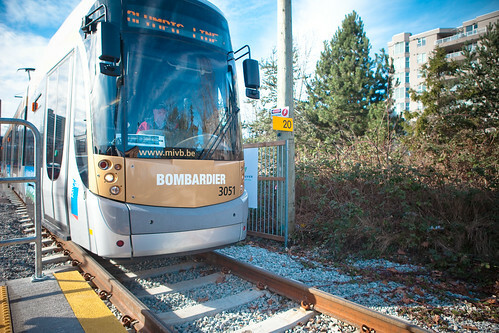 Bombardier has given Vancouver two of their streetcars, on loan from Brussels, Belgium. The Olympic Line is a 60 day demonstration project so get a ride while you can! 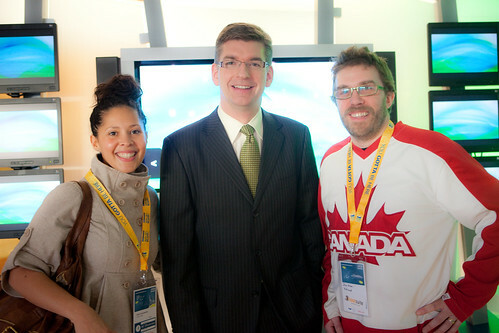 Visitors have been packing into Vancouver from all over the world for the 2010 Winter Olympics. 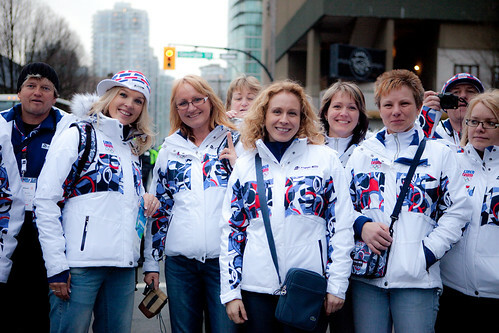 This group of women associated with Ukrainian team were photographed on their way into the Opening Ceremony on February 12th. 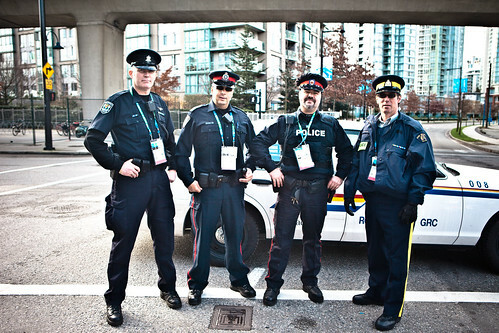 Another type of visitor that has been sighted in Vancouver is the increase in public security, with the influx of police from other provinces. These police officers are in fact from four different Canadian provinces! It was very exciting to watch the crowd gather for the Opening Ceremony at the German Saxony House. The place was packed with locals and visitors for the three hour televised event. Of course, everyone went nuts when the Canadian team was ushered into BC Place. 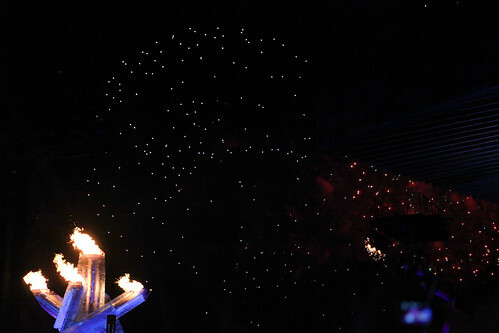 The biggest secret of the 2010 Winter Olympics was the identity of the person who was to light the final torch in Vancouver during the official welcoming of the Games. Wayne Gretzky ended up carrying the torch from BC Place to the final outdoor giant torch at Waterfront station in a great fanfare. The night ended with a fireworks-filled sky.